Continental and ocean crusts make up the lithosphere along with the cool and strong part of the mantel. In the asthenosphere, where the mantel behaves like a liquid, heat is transferred from the interior of the earth and brought towards the surface causing the motion of mantel as seen in the image above. The different plates that make up the lithosphere respond to this motion and 'float' across the asthenosphere. Deep beneath the asthenosphere, hot spots give rise to volcanic activity demonstrating plate motion over time. 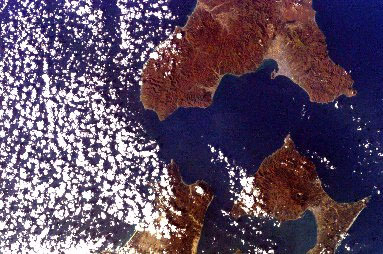 Examples of such hot spots are the Galapagos Islands, Yellowstone, Wyoming, and the Hawaiian Islands pictured here. As the plate moves, volcanic activity gives rise to islands and then moves to render the old volcano extinct and starts the development of new islands. 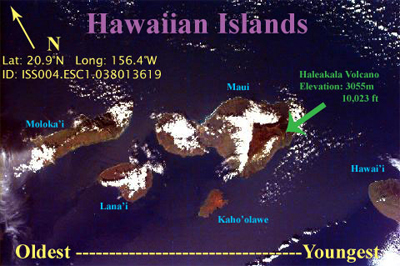 As a result, islands are younger were the volcano is still active and getting older as one moves farther away as seen in the image above. The Hawaiian Islands are situated in the middle of the Pacific Plate and have no connection with the activity that occurs at the plate boundaries. Plates are defined by seismic activity (earthquakes) that occur on their boundaries and move on the order of cm/year. There are four types of boundaries: divergent, convergent, transform and plate. Divergent boundaries were first recognized as part of the seafloor spreading theory. They occur where two plates pull apart from one another and new mantel is pushed up between the gap to form new crust, sometimes violently in the case of volcanoes. The most notable divergent boundaries are seen as mid-ocean ridges in the Pacific and Atlantic Oceans. Divergence is also seen on continents in places like Iceland and the great rift valley of eastern Africa. By looking at the great rift one can theorize as to how the Atlantic Ocean was formed. In its early stages, the land probably looked similar to the image above. Pictured is Lake Tanganyika with the Democratic Republic of Congo on is its shores. The lake is the largest lake by volume in Africa and second largest by surface area. 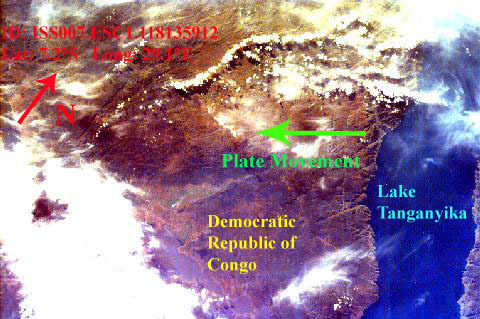 It was formed by the African plate, shown in the image, pulling away from the Indian plate, not shown. The movement of plates caused the Malagarasi River, the major inflow of Lake Tanganyika, to become blocked which flooded a valley resulting in cliffs that reach as high as 2000 feet and can be clearly seen in the image. In time, the plates will continue to pull apart until the entire rift area is filled with water forming a body of water similar to the Red Sea as pictured in the image below. 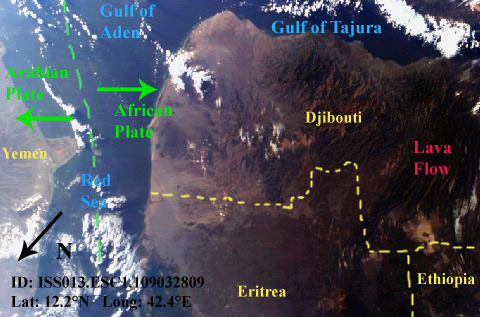 As the Arabian and African plates pulled apart, water from the Indian Ocean came in through the Gulf of Aden to fill the Red Sea. Lava flow in the right side of the image indicates the volcanic activity that is common along divergent boundaries. Convergent boundaries occur when two plates collide head on causing one plate to sink under the other or simply crushing together to form mountains, depending on the type of plates interacting. When two ocean crusts collide, one sinks under the other creating a subduction zone where deep trenches are found. Alongside these trenches, on the crust that does sink, volcanic activity is present. 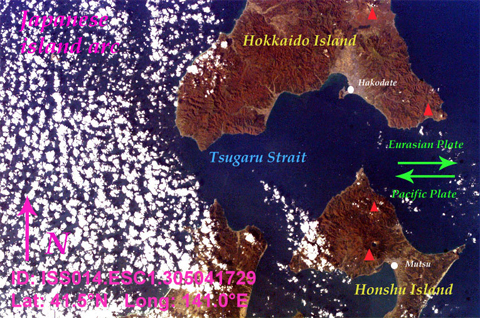 Over time, volcanic activity produces enough lava and debris to form island arcs such as the Japanese Island Arc in the image on the left. Red triangles indicate sites of current or extinct volcanoes. Just off the image above is the corresponding Japan Trench caused by the Pacific Plate sinking and ultimately melting back into the mantel underneath the Eurasian Plate. Similar to the oceanic-oceanic interaction, an oceanic plate will always sink beneath the thicker continental crust. This results in a deep subduction zone in the ocean and the uprising of land forming mountains on the continent. 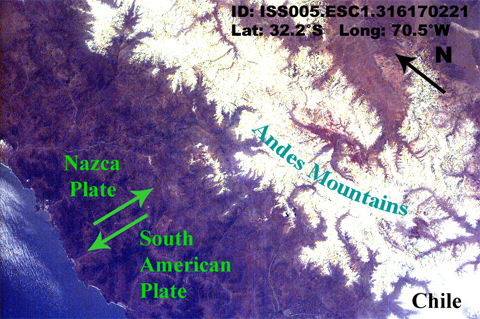 The Andes Mountains are an example of this interaction between the Nazca and South American plates seen in the image above. Common to subduction zones are volcanoes and violent earthquakes that can raise the level of land by several meters. Unlike the oceanic-oceanic or oceanic-continental convergences, continents typically interact in a way to form mountain ranges such as the Himalayan mountain range. 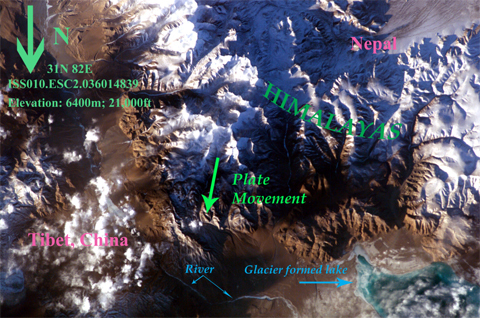 In this example, the Indian plate sinks under the Eurasian plate as the Eurasian plate lifts to form the Tibetan plateau and crumples forming the Himalayas. This extreme case is not only home to the tallest peak in the world, Mount Everest rising to a height of 29,028 feet, but also the highest and biggest plateau in the world, the Tibetan Plateau averaging a height of 14,700 feet. At transform boundaries crust is neither created nor destroyed. 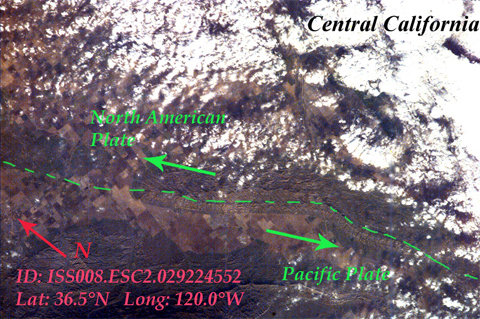 Although typically found under the ocean, the San Andreas fault in California gives the best image of this type of boundary as seen below. This image is of the central valley of California that uses its land mainly for agriculture. The dotted green line represents the fault line and evidence of it can be seen as the uplifted portion of land that rises several hundred feet above ground. Shallow earthquakes characterize these boundaries. This last category fits all the complex interactions of plates that have yet to be determined. Microplates are commonly found along these boundaries and it is because of them that it is difficult to establish the effect of these interactions. An example of this is around the Mediterranean Sea between Europe and Africa. Pinet, Paul R. Invitation to Oceanography 3ed. Sudbary, MA. 2003. pgs 61-80.